The price at which a service is sold is part of the marketing mix, a tool which is used to make decisions that leads to the execution of a marketing plan. When marketing for services, the “four P’s”, price, product, promotion and place are often supplemented by people, process and physical environment. A recent Deloitte review concluded that pricing has ‘two to four times the impact on profits compared to the other business levers’. During the economic downturn, many businesses looked carefully at their own costs – many of which will of course be someone else’s sales. It follows that most people will have experienced pressure to lower or discount their own prices, and there is a general feeling amongst service providers that customers want ‘more for less’ and ‘value’. For a business operating on a 20% profit margin - where costs form 80% of normal sales - even a modest 5% discount will trigger a 25% reduction in profits. Pulling the discount lever can be very dangerous. What’s your cost base compared to your competitors, locally, nationally and globally? Isolated action in one service line could damage the ability of the rest of the firm to win decent margin work. And actually it’s not too clear that discounting actually wins more work. With a product, the buyer is often able to make a reasonable assessment of quality in advance of the purchase. However, for services, one perceived indicator of quality is price – it both attracts and repels! In some aspects of professional services, such as a property conveyance, for example, the service has become more like a ‘product’ (e.g. Enact). Will discounting win me more work? According to some recent surveys, probably not! We look at how to deliver perceived value (subjective) and get paid properly for the value delivered. Include your pricing strategy as part of the marketing mix in your business plan. What's your position in the market – are you a sausage machine? And how do you justify your price? Not everyone can occupy the price point of slightly above average! What is your opportunity approval process - should you be pitching or offering to do it? Scope rigorously and monitor changes. Your garage may well call to ask if you want the wipers or brake pads replaced when your car is being serviced, and as result you are quite happy to pay a higher charge when you collect it. This contrasts with the position if the work had been done without your prior agreement. Professional services are no different? Is the estimate of cost reviewed in the light of actual performance and the tool updated? Right people, right skills, right thing? What is the real cost and margin? Train, resource and support those who price. Provide tools and parameters. Market price: what is the state of the market? Have we, since 2008, got into the habit of discounting? Has the market moved on? Confidence: if your cost is in line with the market price be confident about achieving it. Track record: give evidence of your skill, expertise and past performance / references. Hourly rates: few customers are prepared to accept an indeterminate cost based on what they perceive to be an unreasonably high hourly rate, where the clients desire to get the work done in less hours is not aligned with the provider’s goal of more time spent and a higher fee! Scope very carefully, giving options where appropriate. Look at the overall bundle of services performed for that client. Differentiate your services in the context of the value for the client? Discuss the price up front. It’s usually better to know your potential customer's perception of the value of your work is low (and maybe lower than your cost) in advance of you doing it and then having to spend time resolving the ensuing dispute over the bill. Or worse, after the ‘Solicitor’s letter’. Sometimes clients don’t know the questions to ask or understand the issues, and work, involved. Convey an overview understanding of the work you need to do. People buy from people and the research shows that the sales process is still crucial. Scope, scope, scope! – monitor and communicate. It might be possible to lower the price by reducing the scope. Focus on value not cost (but be conscious of the cost / affordability). The decision is easy when the value is clear. Collaborative approach. Align the firms and the clients’ interests, maintaining honesty and integrity. Might the firm be allowed more time to perform the work so that it could initially be used to develop more junior people? Be flexible – a menu of options (not just a discount). Uncertainty not liked. Would you ask a builder to extend your house without agreeing a price? Fixed fees. Risk – on whom. Impact on price? Can you capture the risk premium? Have you done similar work before? Payment flexibility. If a potential customer does not have the budget for your service in the current period, could part of the work, and/or the bill, be deferred with clear agreement on prompt payment at that time? Generally, send bills promptly when the work has been completed and the customer remembers what was involved and is more likely to recognise the value. 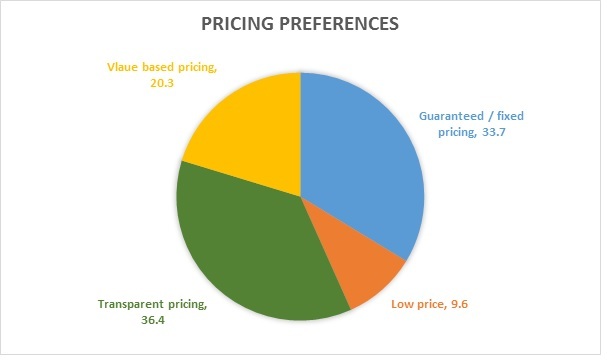 In a survey conducted by Altman Weil, ‘in house legal’ were asked: excluding ‘bet the company’ matters, if you could select only one of the following legal advice pricing preferences, which would you want most? The results placed a low price 4th. Loss leader: below operating margin, relieves on connected purchase of higher margin items. Price skimming: start high (few sales to break even) and lower over time. Targets early adopters with relatively low price sensitivity. Bundle pricing: (package deals/anthologies e.g. DVDs or TV/internet/phone) can drive out rivals. Value-based pricing: Worth to customer rather than cost to supplier. Based on actual needs. Geo pricing: Integration of geographic intelligence e.g. location of customer – at that time. Surge pricing (Uber – US patent 2013). The effect of discounting on profits was mentioned in the introduction, but what about the effect on profits if prices can be increased? In the example at the beginning, a 5% increase in price equates to a 25% increase in profit. A 10% price rise results in a 50% increase in profits. ‘Countless market-based research reports demonstrate unequivocally that a 5% to 15% increase in turnover is readily achievable using a more sophisticated approach to pricing’ (Deloitte Consulting, PwC, KPMG). Pricing should not merely be an administrative function. Is it an art, a science or perhaps a skill (an ability to do an activity or job well, especially because you have practiced it)? Whichever, it merits proper attention in your business.